The evolution of the Adventure Palace slot from software developer Microgaming is one of an interesting path. 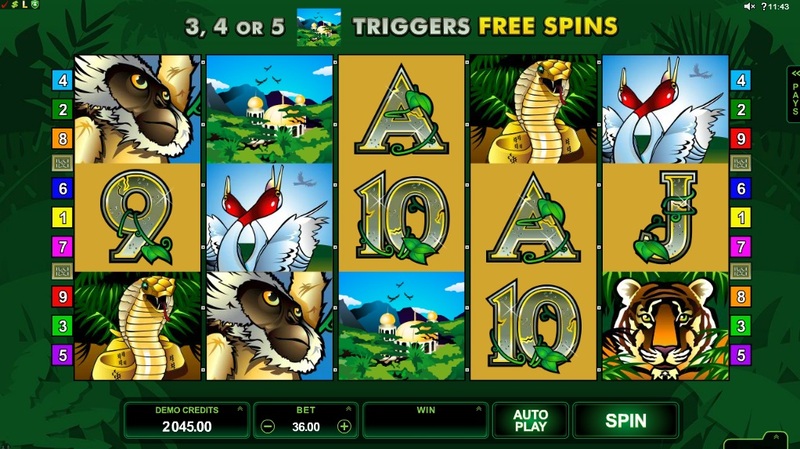 The slot was originally added to the developer's portfolio when the graphics on slots were not exactly cutting edge. However, the slot enjoyed success and the developer decided it was worth releasing it on the mobile platform with the Adventure Palace mobile slot. Now, the game has entered a redux stage where it has been released with HD graphics. Adventure Palace HD is a 5 reel, 9 payline wild animal-themed slot. The reels are set against what looks like a jungle but the animals that are included as symbols on the reels are not restricted to animals you might find in the jungle. The symbols include wild animals such as tigers, monkeys, peacocks, birds, and snakes as well as the regular 9-through-to-Ace symbols that are presented as shiny stone structures with greenery draped over them. The Wild is present on the reels in the form of an elephant. This specific elephant appears to be dressed as an Indian elephant as opposed to an African elephant that you might find on the savannah of Africa. Hit five of these Wilds across the reels and you will get a 5,000 coin win. Wild wins will also bring a 2x multiplier with them. It also substitutes for all other symbols, except for the temple Scatters, to complete winning combinations. If you hit three or more of these temple Scatters then you will trigger the free spins bonus round. This will see you awarded 15 free spins with a 3x multiplier attached to any wins triggered during the free spins. 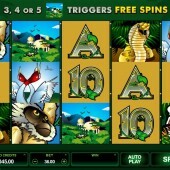 It is also possible to re-trigger the free spins if you hit three or more Scatters across the reels on a free spin. Adventure Palace HD does not move any ground. Very much in the same way that Microgaming's cowboy-themed Sterling Silver 3D slot was just basically a shinier and more beautiful version of its standard predecessor. That said, Adventure Palace was a top slot and improving the graphics makes it a more appealing slot to the newer generation of players that shun the early slots with poor graphics. Never judge a slot by its graphics people! The fact you can win up to 150,000 coins on this slot is also a good reason to go back to the old school.